we've mentioned our love of belgian-style white ale before here, and especially the adorable owl on the hitachino label. while reading grub street a few weeks ago, we saw that alton brown shares our love for this great japanese beer! so when we came across this recipe from an old issue of Food & Wine magazine using white ale, we knew it would be right up our alley. the recipe is from Sang Yoon, owner of the awesome gastro pub Father's Office - an institution with two locations in southern CA. thinking of the amazing beers on tap paired with their famous burger makes us miss the sunshine state a little! make sure to serve these mussels with a big spoon and lots of bread to mop up the delicious sauce. in a saucepan, heat the oil. add red curry paste, garlic, ginger and lemongrass and cook over medium heat for 2 minutes. add mirin, coconut milk, soy sauce, fish sauce and basil leaves and simmer for 15 minutes. strain the red curry sauce into a bowl. in a large saucepan, bring ale to a boil. add mussels, cover and cook over night heat, about 5 minutes. discard any mussels that do not open. divide mussels between four bowls. add the red curry sauce to the ale and boil about 1 minutes. pour sauce over mussels and sprinkle with chopped cilantro. enjoy! Simple pleasures are often the nicest - mopping up the delicious sauce with some bread and sipping the cool ale counts as one of the best in my book. Theme is lookin very cool, everything is lookin fabulous. mussels and beer...as Belgians we can only applaud that! the combination with red curry is new to us and definitely a must try. 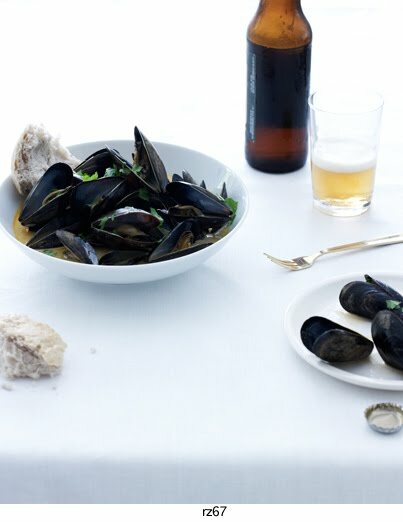 If I didn't already love mussels and white ale, this photo alone would have sold me. Everything about this is perfection! This looks amazing...Can't wait to try! my god I love that photo. so very much. Just back from Montreal and already dying for another bottle of their local brewer Unibroue's white ale, 'Blanche de Chambly'. Give it a try if you can find some on tap in your area. ale & mussels are something i would enjoy on a summer sunday afternoon! delicious.....i also am finding ciders particularly tasty - monteiths crushed pear cider is excellent! Lovely, lovely photo. I'm looking forward to trying the recipe. I am new to this 'smorgasbord' of posts and am delighted I found my way here! This mussel post looks wonderful and I am so looking forward to trying this out. Your work is wonderful. Enjoying this so much.